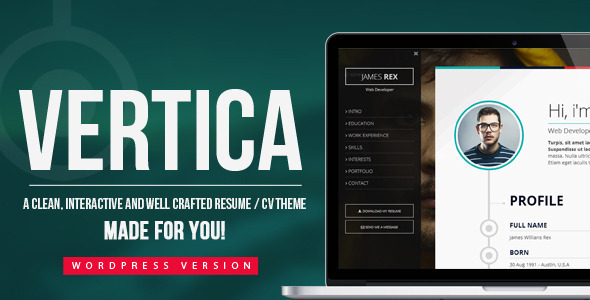 Vertica is a clean, multipurpose and well crafted wp theme. It’s a cv / resume / vCard focused on digital professionals, whether designers, programmers or photographers. It is perfect to promote your work! It features an interactive timeline, improving the user experience. Vertica is 100% responsive, retina ready and is built on Bootstrap Framework, with easy customization. It Also have Smooth Scroll, improving the user experience on all devices. Theme does not support drop down menus. It will show all as parent menu item. Update its manual guide (Documentation).. Adding social icons option's shortcode. Remove theme option box shadow. Create a new option for adding portfolio video. Create a new option for adding portfolio external site link. Fixing responsive issue for i-phone and another devices. fixing here little issue of css. update here prettyPhoto 3.1.6 as Envato requirements and fixing responsive menu issue. Add here Blog section and update some css. Original awesome design & behaviour: DotRex. Thank you! Don’t forget to rate us!